The eternal question: Which came first? The answer is a semantic one: What is your definition of “egg”? Egg: A gestation device laid by birds, fish, and reptiles. The dinosaurs laid eggs, therefore, the egg pre-dates the chicken. Egg: A gestation device laid by birds. Other birds pre-dated the chicken, therefore, the egg came first. What about a “Chicken Egg”? The first “chicken egg” had to follow the first chicken in order to be laid by one, thus, the chicken came first. We assume the first CHICKEN came from the egg of some other slightly different bird variety that was NOT a chicken. Some other slightly different bird variety laid the first CHICKEN EGG, which subsequently produced the first CHICKEN. Thus, the chicken egg came first. 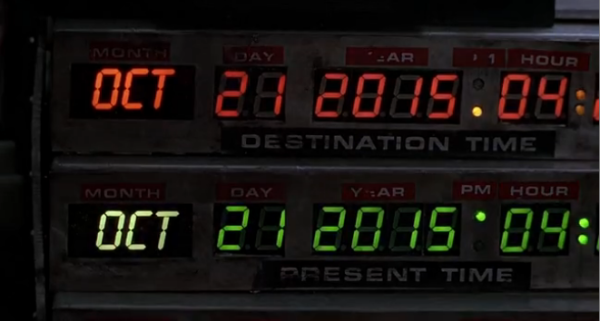 In the movie, Back to the Future II, Marty, Doc, and Jennifer travel to October 21, 2015 from the year 1985. Although the movie immediately follows events at the end of the original Back to the Future, the movie itself was actually released in 1989. The future tech in BTTF II, therefore represents a 26 year guess in to the future. As of this writing, we just passed BTTF Day, so the future is now. Let’s see how the writers did, predicting future tech. Pi is an infinite, non-repeating decimal – meaning that every possible number combination exists somewhere in pi. Converted in to ASCII text, somewhere in that infinite string of digits is the name of every person you will ever love , the date, time, and manner of your death, and the answers to all the great questions of the universe. Converted in to a bitmap, somewhere in that infinite string of digits is a pixel-perfect representation of the first thing you saw on this earth, the last thing you will see before your life leaves you, and all the moments, momentous and mundane, that will occur between these two points. All information that has ever existed or will ever exist, the DNA of every being in the universe. Everything: all contained in the ratio of a circumference and a diameter. This is poetic, but false.